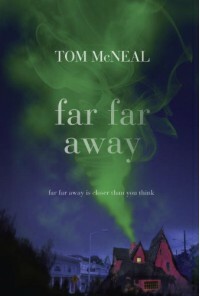 I received a copy of Far Far Away from the publishers via NetGalley in return for an honest review. I have mixed feelings on this one, I really liked the premise of Far Far Away. I mean cmon, if you were a kid who loves to read and could hear the voice of any ghost, being able to chat with the ghost of one half of the Brothers Grimm. It would be a dream come true. That being said, this book felt really slow. I enjoyed it but it just took too long to get to the real grit or even just a hint of what was happening, and even then it just seemed to skim over it like it wasn't that big of a deal. Don't get me wrong, the story was cute and it was creepy but it felt flat to me. The characters needed more depth, they just didn't seem real. The little back story that was given about the characters themselves just wasn't enough to make you feel anything for them, or to be able to relate to them in anyway. Personally I felt like the story was dragged out and the exciting bits were kind of brushed over and overshadowed by everything inbetween.